The use of silicon-based microsystems for chemical analysis is one of the most promising concepts in the recent developments in micro system technology (MST). It is expected that chemical sensors will be increasingly integrated in so-called miniaturized total analysis systems (muTAS), a concept first presented by Ciba-Geigy. In such systems, all steps in a chemical determination, from sampling to detection and data treatment, are integrated in one miniature instrument. muTAS offer a variety of advantages over conventional analysis systems such as improved analytical performance, reduced reagent and power consumption, small size, possibility of new and more complicated functions, higher reliability and lower fabrication costs. Application of muTAS may be found in fields like process industry, environmental monitoring, medical diagnostics, aeronautics, automotive industry, etc. The Challenge of Developing muTAS, P. Bergveld. muTAS: Miniaturized Total Chemical Analysis Systems, A. Manz, E.M.J. Verpoorte, D.E. Raymond, C.S. Effenhauser, N. Burggraf, H.M. Widmer. Chances of muTAS in Analytical Chemistry, W.E. van der Linden. muTAS for Biochemical Analysis, I. Karube. Detection Principles for muTAS, H.-J. Ache. Microfabricated Liquid Handling Elements, H. Sandmaier, R. Zengerle, A. Richter. Micromechanical Components for muTAS, J.H. Fluitman, A. van den Berg, T.S. Lammerink. Material Science for Future (Bio)Chemical Microsystems: the Key Role of Tailoring Interfaces, W. Göpel. Optical Microsystems for (Bio)Chemical Analysis, O.S. Wolfbeis. Integration of Analytical Systems Incorporating Chemical Reactions and Electrophoretic Separation, D.J. Harrison, K. Fluri, Zhongui Fan, K. Seiler. Flow Injection Microsystems -- There is a Past but Where is the Future? J. Ruzicka. Micromachined Flow-Through Measurement Chambers Using LAPS Chemical Sensors, L. Bousse, R. McReynolds. Development of a PCR Microreactor, M.A. Northrup, C. Gonzales, S. Lehew, R. Hills. Application of Miniature Analyzers: From Microfluidic Components to muTAS, J. Branebjerg, B. Fabius, P. Gravesen. Microanalysis Systems for Gases, I. Lundström, A. Lloyd-Spetz, H. Sundgren, F. Winquist. Bonding and Assembling Methods for Realizing a muTAS, S. Shoji, M. Esashi. 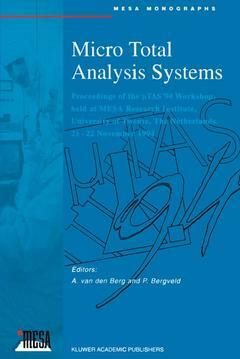 Microsystems for Analysis in Flowing Solutions, B.H. van der Schoot, E.M.J. Verpoorte, S. Jeanneret, A. Manz, N.F. de Rooij. Combined Blood Gas Sensor for pO2, pCO2 and pH, Ph. Arquint, B.H. van der Schoot, N.F. de Rooij. A Fluid Handling and Injection Microsystem for a muTAS, N. Croce, M.C. Carrozza, P. Dario. Design of an Adaptive Unsupervised Hybrid Microsystem for Artificial Olfaction, F.A.M. Davide, C. di Natale, A. d'Amico. Integration of an Amperometric Glucose Sensor in a &mgr,TAS, L. Forssé,n, H. Elderstig, L. Eng, M. Nordling. Electric Field Mediated Cell Manipulation, Characterisation and Cultivation in Highly Conductive Media, G. Fuhr, B. Wagner. Electrochemical Microanalytical System for Ionometric Measurements, W. Hoffmann, M. Bruns, B. Bü,stgens, E. Bychkov, H. Eggert, W. Keller, D. Maas, R. Rapp, R. Ruprecht, W. Schomburg, W. Sü,ß,. Modulator Potentiometric Measuring System for the Development and Comfortable Testing of Miniaturized Ion Sensors, W. Hoffmann, R. Rapp, H.J. Ache. A Novel Sampling Technique for Total Analysis Systems, W. Kü,nnecke, U. Bilitewski. A Micromachined Glucose Oxidase Enzyme Reactor, T. Laurell, L. Rosengren, J. Drott. First Steps of &mgr,TAS in Latvia, A. Lú,sis, J. Kleperis, V. Eglì,tis, A. Lloyd-Spetz, I. Lundströ,m, H. Sundgren, F. Winquist, G. Strautmanis, I. Slaidi&ncaron,s, P. Misâ,ns, P. Rozukalns, S. Sjulzics. Microreactor with Integrated Static Mixer and Analysis System, H. Mensinger, Th. Richter, V. Hessel, J. Dö,pper, W. Ehrefeld. Microelectrode Arrays as Transducers for Microanalysis Systems, H. Meyer, B. Naendorf, M. Wittkampf, B. Grü,ndig, K. Cammann. A Stacked Multichannel Amperometric Detection System, M. Paeschke, U. Wollenberger, A. Uhlig, U. Schnakenberg, B. Wagner, R. Hintsche. Components for Microfluidic Handling Modules, W.K. Schomburg, B. Bü,stgens, J. Fahrenberg, D. Maas. Development of a Micro Flow-System with Integrated Biosensor Array, G. Urban, G. Jobst, P. Svasek, M. Varahram, I. Moser, E. Aschauer. Temperature Controller for &mgr,TAS Applications, P. van Gerwen, K. Baert, T. Slater, L. Hermans, R. Mertens. Redox-Sensitive Field-Effect Transistors as Transducers for Microanalysis Systems, T. Vering, D. Seiwald, W. Schuhmann, H.-L. Schmidt. Performance of the Coulometric Sensor-Actuator Device Improved by &mgr,TAS, W. Olthuis, P. Bergveld. Concept of a Miniaturized System for Multi-Component Gas Analysis Based on Non-Dispersive Infrared Techniques, M. Gebhard, W. Benecke. A Double CHEMFET Flow Cell System for Detection of Heavy Metal Ions and Integration in &mgr,TAS, J.F.J. Engbersen, P.L.H.M. Cobben, R.J.W. Lugteberg, D.N. Reinhoudt. Components and Technology for a Fluidic-ISFET-Microsystem, H. Fiehn, S. Howitz, M.T. Pham, T. Vopel, M. Bü,rger, T. Wegener. An ON-Chip Miniature Liquid Chromatography System: Design, Construction and Characterization, S. Cowen, D.H. Craston. A Microsystem Mass Spectrometer, A. Feusetl, J. Mü,ller, V. Relling. Authors Index. Subject Index.